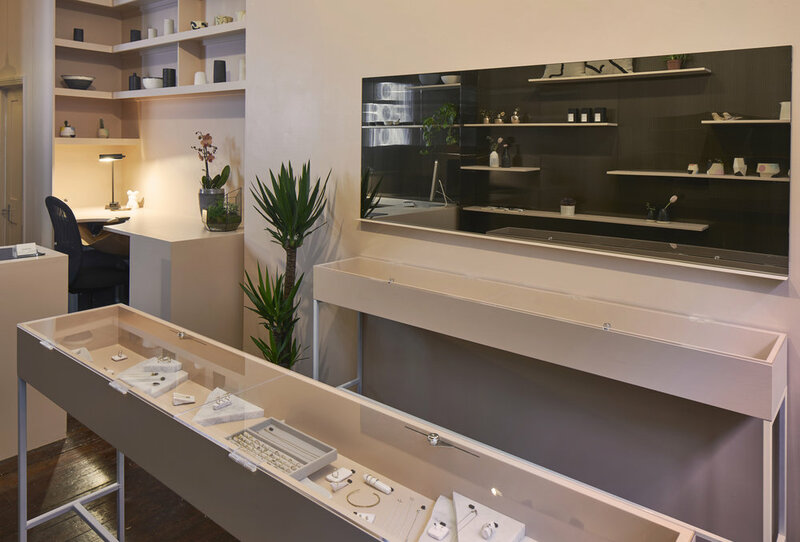 A COMPLETE INTERIOR DEsign and shop fit for oh|boston, a jewellery and homeware boutique in east london. A wall of floating shelving clad in bronze polycarbonate displays ceramics, textiles, books and more - whilst simultaneously housing cables for cctv and alarm and telephone systems. two console style display cabinets with lockable acrylic lids display jewellery of various designers. two workstations for in house jewellery making and a till area with a white neon logo sign visible from the street. Materials: Painted timber, steel, polycarbonate panels, neon light.